You know you’re doing something right in politics when your political opposition thinks you’re enough of a threat to warrant a ten-minute diatribe on MSNBC. Rachel Maddow recently took aim at at the Heritage Foundation and in particular, the volunteers of its sister organization, Heritage Action, called Sentinels. Although Maddow’s planned tactic was ridicule, Sentinels are downright giddy at being singled out by the half-wit on MSNBC. It means we’re being effective so they need to try to take us out. We’re just sorry the network is one of the least-watched in America with dismal ratings, or the segment might have gotten more play. Maddow’s tactic is to be so snarky and condescending as to appear authoritative. Of course, it’s easy to ramble incessantly when there’s no one there to refute your hack logic. The segment begins with an illogical rant about how ca-razy Rush Limbaugh was for noting the coincidence of Hollywood’s release of The Dark Knight Rises with its villain, Bane, contrasted with the at-the-time hot and highly derided topic Mitt Romney’s business, Bain Capital. Maddow thinks this is so off the wall because, like, the comic-book villain was originally created twenty years ago. Really? Leave it to Maddow to answer a question no one is asking: Was the villain originally conceived to create a negative association with Romney’s Bain Capital? Hardly, but Rush has a point that the homophone could well have had that effect on oh-so-astute Obama voters (anyone remember the woman who thought she’d never have to pay another bill once he was elected?) with the release of the movie just before the 2012 presidential election. This is too much of a stretch of an association for Maddow. Why is she bringing all this up? Because she needs a segue to the Marvel Comics villains, the Sentinels. Hear that, Heritage? You could’ve, like, Googled it before you started your program! If you do Google it, one of your first results is indeed the comic strip characters, offered by that bastion of objective knowledge, Wikipedia. Good research, that. The word associations of the masses will of course depend on how many Comicon enthusiasts made up your sampling and, markedly, their reading level. What is clear is that Rachel Maddow definitely wants the term to conjure images for you shallow thinkers of take-over-the-world mutant-hunter comic villains. For the rest of us with any modicum of literacy, the term “Sentinel” conjures images of…its definition: sentry; and its synonyms: guardian, watchman, keeper, custodian, and lookout. Don’t disturb Rachel with the fact that this word has been around for the better part of five hundred years. Maddow is depending on the idea that a comic strip is where your thinking will end when you hear “Sentinel.” But there’s a new association in modern culture for the word, brought to you care of Heritage Action. A name in common with a comic strip doesn’t diminish the mission or effectiveness of today’s conservative grassroots activists who have happily found support in the highly respected Heritage Foundation, whose Scorecards on key votes have representatives thinking twice about voting on the liberal side. It also won’t deter these activists who would be doing the same whether Heritage Action existed or not. Incidentally, Maddow is stumped about Heritage’s choice of Jim DeMint as its new president. She says, “Senator DeMint managed to breeze through eight years in the U.S. senate without a single landmark law to call his own. For a place that wants to style itself as a think tank, a policy shop, a research institution, Jim DeMint was a weird hire to be their president.” I’m sure if she’d been consulted on Heritage’s hiring decision, she indeed would not have chosen the (only) man whose voting record was given a score by Heritage Action of 99% conservative. Maddow tries to frame the Heritage Action Sentinels as “honor-bound to Heritage to hold Congress accountable,” as if we’ve got nothing better to do than mindlessly obey orders. To the contrary, we are involved citizens keeping our representatives accountable, now with the help of Heritage, because we are their bosses and their bad, mostly liberal decisions have helped put the economy, healthcare, education, immigration and foreign policy in the toilet. We are a serious threat to the left in their endeavors to take away our Natural Rights and subordinate us to the will of the State while using our own money to do it. We’re happy to be in the crosshairs. It means we’re a force to be reckoned with, and we’re winning. Proud #Sentinels. Very poignant, well written article. The Maddows of the world should be relegated to the trash heap of pseudo journalists that are nothing more than harpies for the Left. Comment from a fellow Sentinel via email: “Boom! That is fabulous and directly on point. It’s clear as a #LowInformationPundent preaching the Dem talking points of the day to #LowInformationVoters. 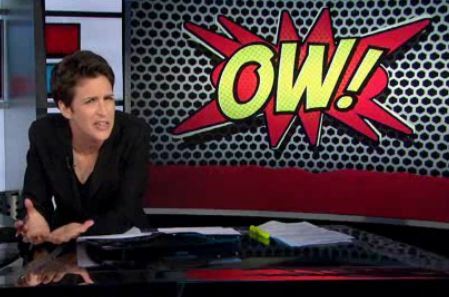 Maddow would much rather do her research via comic books than a dictionary and would rather spew outright lies and ignore the truth. Chalk one up for the grassroots, boots on the ground Heritage Action Sentinels. I’m proud to stand with these outstanding Principled Conservatives.